For other people with the name, see Abu Bakr (name). Abdallah bin Abi Quhafah (Arabic: عبد الله بن أبي قحافة‎; c. 573 CE – 23 August 634 CE), popularly known as Abu Bakr (Arabic: أبو بكر‎),[a] was a companion and—through his daughter Aisha—a father-in-law of the Islamic prophet Muhammad. Abu Bakr was born in Mecca in 573 CE to Uthman Abu Quhafa and Salma Umm al-Khair. He is commonly regarded as the fourth person to have accepted Islam, after Khadija bint Khuwaylid, Ali ibn Abi Talib, and Zayd ibn Harith. Abu Bakr was present at a number of battles of Islam, such as the Battle of Badr and the Battle of Uhud; his role in the early battles of Islam has been the subject of extensive analysis by historians. Abu Bakr was present at the Farewell Pilgrimage, as well as the event of Ghadir Khumm, in 632 CE. However, shortly after Muhammad died, Abu Bakr and some others left the still-unburied body of Muhammad and gathered at a place known as Saqifa. After lengthy debates that included violence, Umar ibn Al-Khattab pledged allegiance to Abu Bakr at Saqifa; he was followed in this by two others at Saqifa, as well as a group of Bedouin tribesmen who had arrived at the scene. Saqifa was later described by the famous Sunni historian Al-Tabari as "a scene from the period of Jahiliya (the pre-Islamic era)". Abu Bakr thus assumed power, ruling over the Rashidun Caliphate from 632 to 634 CE. Once in power, Abu Bakr launched the Ridda Wars to quell an outbreak of "apostasy" in various lands outside Medina. The Ridda Wars, however, were expanded to include the use of force against Muslims who did not recognize Abu Bakr's government, instead of solely focusing on those who had left Islam. After the conclusion of the Ridda Wars, Abu Bakr launched campaigns into Syria and Persia, but died before their conclusion. Another significant event during Abu Bakr's reign was the seizure of the land of Fadak from Fatimah, Muhammad's daughter. In 634 CE, Abu Bakr fell ill from a sickness and died shortly thereafter. He was succeeded by Umar. Rashidun Caliphate during the reign of Abu Bakr. 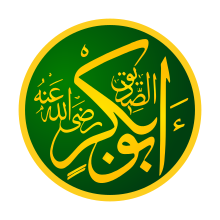 Abu Bakr's full name was Abdullah ibn Uthman ibn Aamir ibn Amr ibn Ka'ab ibn Sa'ad ibn Taym ibn Murrah ibn Ka'ab ibn Lu'ai ibn Ghalib ibn Fihr al-Quraishi. In Arabic, the name Abd Allah means "servant of Allah". One of his early titles, preceding his conversion to Islam, was Ateeq, meaning "saved one". Muhammad later restated this title when he said that Abu Bakr is the "Ateeq". He was called Al-Siddiq (the truthful) by Muhammad after he believed him in the event of Isra and Mi'raj when other people didn't, and Ali confirmed that title several times. There is a dispute over his name being Abdullah. Ibn Hajar in Al-Isaabah, as well as many other sources, narrates from Qasim Ibn Muhammad Ibn Abu Bakr, "I asked Aisha the name of Abu Bakr. She said Abdullah. I said people are saying Ateeq. She said Abu Quhafa had three children, one was Ateeq, second Mu’taq and third, Utaiq. "All three names are similar and derived from the same root. He was reportedly referred to in the Quran as the "second of the two in the cave" in reference to the event of hijra, where with Muhammad he hid in the cave in Jabal Thawr from the Meccan party that was sent after them. Many Sunni hadiths available about Muhammad comes through Abu Bakr's daughter Aisha. After the death of Abu Bakr, her brother Muhammad ibn Abu Bakr was emancipated by Ali. After Muhammad ibn Abu Bakr was killed by the Umayyads, Aisha raised and taught her nephew, Qasim ibn Muhammad ibn Abu Bakr and her nephew Urwah ibn Zubayr. He then taught his son, Hisham ibn Urwah, who was the main teacher of Malik ibn Anas, whose views many Sunni follow. Qasim's mother was of Ali's family and his daughter Farwah bint al-Qasim, who married Muhammad al-Baqir, was the mother of Jafar al-Sadiq. Therefore, al-Qasim was the grandson of the first caliph Abu Bakr and the grandfather of Ja'far al-Sadiq. Another of Abu Bakr's grandsons, Abd Allah ibn al-Zubayr, was very close to Husayn bin Ali. After Hussein ibn Ali was betrayed by the people of Kufa and killed by the army of Yazid I, the Umayyad ruler, Abd Allah ibn al-Zubayr confronted Yazid and expelled him from Iraq, southern Arabia and the greater part of Syria, and parts of Egypt. Following a lengthy campaign, on his last hour Abd Allah ibn al-Zubayr asked his mother Asma' bint Abu Bakr, the daughter of Abu Bakr, for advice. Asma' bint Abu Bakr replied to her son: "You know better in your own self, that if you are upon the truth and you are calling towards the truth go forth, for people more honourable than you have been killed and if you are not upon the truth, then what an evil son you are and you have destroyed yourself and those who are with you. If you say, that if you are upon the truth and you will be killed at the hands of others, then you will not truly be free". Abd Allah ibn al-Zubayr left and was later also killed and crucified by the Syrian Army, then under the control of the Umayyads. Abu Bakr was born in Mecca some time in 573 CE, to a rich family in the Banu Taym tribe of the Quraysh tribal confederacy. Abu Bakr's father's name was Uthman and given the laqab Abu Quhafa, and his mother was Salma bint Sakhar who was given the laqab of Umm ul-Khair. He spent his early childhood like other Arab children of the time, among the Bedouins who called themselves Ahl-i-Ba'eer- the people of the camel, and developed a particular fondness for camels. In his early years he played with the camel calves and goats, and his love for camels earned him the nickname "Abu Bakr", the father of the camel's calf. Like other children of the rich Meccan merchant families, Abu Bakr was literate and developed a fondness for poetry. He used to attend the annual fair at Ukaz, and participate in poetical symposia. He had a very good memory and had a good knowledge of the genealogy of the Arab tribes, their stories and their politics. A story is preserved that once when he was a child, his father took him to the Kaaba, and asked him to pray before the idols. His father went away to attend to some other business, and Abu Bakr was left alone with the idols. Addressing an idol, Abu Bakr said "O my God, I am in need of beautiful clothes; bestow them on me". The idol remained indifferent. Then he addressed another idol, saying, "O God, give me some delicious food. See that I am so hungry". The idol remained cold. That exhausted the patience of young Abu Bakr. He lifted a stone, and, addressing an idol, said, "Here I am aiming a stone; if you are a god protect yourself". Abu Bakr hurled the stone at the idol and left the Kaaba. Thereafter, he never went to the Kaaba to pray to the idols. He was a man with fair skin, thin, emaciated, with a sparse beard, a slightly hunched frame, sunken eyes and protruding forehead, and the bases of his fingers were hairless. He remained a hanif until converting to Islam and never worshipped idols. Other Sunni and all Shi'a Muslims maintain that the second person to publicly accept Muhammed as the messenger of God was Ali ibn Abi Talib, the first being Muhammad's wife Khadija. Ibn Kathir, in his Al Bidaya Wal Nihayah, disregards the above. He stated that the first woman to embrace Islam was Khadijah. Zaid bin Haarithah was the first freed slave to embrace Islam. Ali ibn Abi Talib was the first child to embrace Islam for he has not even reached the age of puberty at that time, while Abu Bakr was the first free man to embrace Islam. His wife Qutaylah bint Abd-al-Uzza did not accept Islam and he divorced her. His other wife, Um Ruman, became a Muslim. All his children except Abdu'l-Rahman ibn Abu Bakr accepted Islam, and Abu Bakr separated himself from Abdu'l-Rahman. His conversion brought many people to Islam. He persuaded his intimate friends to convert, and presented Islam to other friends in such a way that many of them also accepted Islam. Abu Bakr's acceptance proved to be a milestone in Muhammad's mission. Slavery was common in Mecca, and many slaves accepted Islam. When an ordinary free man accepted Islam, despite opposition, he would enjoy the protection of his tribe. For slaves, however, there was no such protection and they commonly experienced persecution. Abu Bakr felt compassion for slaves, so he purchased eight (four men and four women) and then freed them, paying 40,000 dinar for their freedom. Most of the slaves liberated by Abu Bakr were either women or old and frail men. When the father of Abu Bakr asked him why he didn't liberate strong and young slaves, who could be a source of strength for him, Abu Bakr replied that he was freeing the slaves for the sake of Allah, and not for his own sake. For three years after the birth of Islam, Muslims kept their faith and prayers secret. In 613 Muhammad was commanded by God to call people to Islam openly. The first public address inviting people to offer allegiance to Muhammad was delivered by Abu Bakr. In a fit of fury the young men of the Quraysh tribe rushed at Abu Bakr, and beat him mercilessly till he lost consciousness. Following this incident Abu Bakr's mother converted to Islam. Abu Bakr was persecuted many times by the Quraysh. Abu Bakr's beliefs would have been defended by his own clan, but not by the entire Quraysh tribe. In 617, the Quraysh enforced a boycott against the Banu Hashim. Muhammad along with his supporters from Banu Hashim, were cut off in a pass away from Mecca. All social relations with the Banu Hashim were cut off and their state was that of imprisonment. [clarification needed] Before it many Muslims migrated to Abyssinia (now Ethiopia). Abu Bakr, feeling distressed, set out for Yemen and then to Abyssinia from there. He met a friend of his named Ad-Dughna (chief of the Qarah tribe) outside Mecca, who invited Abu Bakr to seek his protection against the Quraysh. Abu Bakr went back to Mecca, it was a relief for him, but soon due to the pressure of Quraysh, Ad-Dughna was forced to renounce his protection. Once again the Quraysh were free to persecute Abu Bakr. In 620, Muhammad's uncle and protector, Abu Talib ibn Abd al-Muttalib, and Muhammad's wife Khadija died. Abu Bakr's daughter Aisha was engaged to Muhammad, however it was decided that the actual marriage ceremony would be held later. In 620 Abu Bakr was the first person to testify to Muhammad's Isra and Mi'raj (Night Journey). In 622, on the invitation of the Muslims of Medina, Muhammad ordered Muslims to migrate to Medina. The migration began in batches. Ali was the last to remain in Mecca, entrusted with responsibility for settling any loans the Muslims had taken out, and famously slept in the bed of Muhammad when the Quraysh, led by Ikrima, attempted to murder Muhammad as he slept. Meanwhile, Abu Bakr accompanied Muhammad to Medina. Due to the danger posed by the Quraysh, they did not take the road, but moved in the opposite direction, taking refuge in a cave in Jabal Thawr, some five miles south of Mecca. `Abdullah ibn Abi Bakr, the son of Abu Bakr, would listen to the plans and discussions of the Quraysh, and at night he would carry the news to the fugitives in the cave. Asma bint Abi Bakr, the daughter of Abu Bakr, brought them meals every day. Aamir, a servant of Abu Bakr, would bring a flock of goats to the mouth of the cave every night, where they were milked. The Quraysh sent search parties in all directions. One party came close to the entrance to the cave, but was unable to see them. Due to this, Qur'an verse 9:40 was revealed. Aisha, Abu Sa‘id al-Khudri and Abdullah ibn Abbas in interpreting this verse said that Abu Bakr was the companion who stayed with Muhammad in the cave. After staying at the cave for three days and three nights, Abu Bakr and Muhammad proceed to Medina, staying for some time at Quba, a suburb of Medina. In Medina, Muhammad decided to construct a mosque. A piece of land was chosen and the price of the land was paid for by Abu Bakr. The Muslims, including Abu Bakr, constructed a mosque named Al-Masjid al-Nabawi at the site. Abu Bakr was paired with Khaarij ah bin Zaid Ansari (who was from Medina) as a brother in faith. Abu Bakr's relationship with Khaarijah was most cordial, which was further strengthened when Abu Bakr married Habiba, a daughter of Khaarijah. Khaarijah bin Zaid Ansari lived at Sunh, a suburb of Medina, and Abu Bakr also settled there. After Abu Bakr's family arrived in Medina, he bought another house near Muhammad's. The climate of Mecca was dry, but the climate of Medina was damp and, because of this, most of them fell sick on arrival. Abu Bakr contracted a fever for several days, during which time he was attended to by Khaarijah and his family. In Mecca, Abu Bakr was a wholesale trader in cloth and he started the same business in Medina. He opened his new store at Sunh, and from there cloth was supplied to the market at Medina. Soon his business flourished. Early in 623, Abu Bakr's daughter Aisha, who was already engaged to Muhammad, was handed over to Muhammad in a simple marriage ceremony, further strengthening relations between Abu Bakr and Muhammad. In 624 Abu Bakr was involved in the first battle between the Muslims and the Quraysh of Mecca, known as the Battle of Badr, but did not fight, instead acting as one of the guards of Muhammad's tent. In 625, Abu Bakr participated in the Battle of Uhud. After the fighting began, the tide of the battle turned at first in the Muslims' favor, in large part due to the actions of Ali ibn Abi Talib, Hamza ibn Abdul Muttalib, and Abu Dujana. However, two events led to the Muslims losing the battle: the death of Hamza and many of the rank-and-file members of the Muslim army abandoning their positions. Many of those Muslims assumed that they had already won the battle, so in an attempt to collect booty from their attackers, they left their positions, against the orders of Muhammad. The Muslims' opponents, the army of Abu Sufyan, took advantage of this to attack the Muslims' army. In the ensuing confusion, in which many Muslim lives were lost, a man named Mus‘ab ibn 'Umair was killed. When he died (although some reports say that it was instead when Husayl ibn Jabir died), a call was raised that Muhammad had died (which he had not), and this also led to many of the Muslims fleeing the battlefield; only a small number of Muslims, such as Ali and Abu Dujana, stayed to protect Muhammad. It has been mentioned in multiple reports that Abu Bakr and Umar were among the Muslims who fled when they were not supposed to. In 627 he participated in the Battle of the Trench and also in the Invasion of Banu Qurayza. In the Battle of the Trench, Muhammad divided the ditch into a number of sectors and a contingent was posted to guard each sector. One of these contingents was under the command of Abu Bakr. The enemy made frequent assaults in an attempt to cross the ditch, all of which were repulsed. Abu Bakr showed great courage in guarding the belt of the trench in his sector. To commemorate this event a mosque, later known as 'Masjid-i-Siddiq', was constructed at the site where Abu Bakr had heroically repulsed the charges of the enemy. In 628 he witnessed the Treaty of Hudaybiyyah. Abu Bakr took part in the Battle of Khaybar. Khaybar had eight fortresses, the strongest and most well-guarded of which was called Al-Qamus. Muhammad sent Abu Bakr with a group of warriors to attempt to take it, but they were unable to do so. Muhammad also sent Umar with a group of warriors, but Umar could not conquer Al-Qamus either. Some other Muslims also attempted to capture the fort, but they were unsuccessful as well. Finally, Muhammad sent Ali, who defeated the enemy leader, Marhab. In 629 Muhammad sent 'Amr ibn al-'As to Zaat-ul-Sallasal, followed by Abu Ubaidah ibn al-Jarrah in response to a call for reinforcements. Abu Bakr and Umar commanded an army under al-Jarrah, and they attacked and defeated the enemy. In 630, when the Muslims conquered Mecca, Abu Bakr was part of the army. Before the conquest of Mecca his father Uthman Abu Quhafa converted to Islam. In 630, the Muslim army was ambushed by archers from the local tribes as it passed through the valley of Hunayn, some eleven miles northeast of Mecca. Taken unaware, the advance guard of the Muslim army fled in panic. There was considerable confusion, and the camels, horses and men ran into one another in an attempt to seek cover. Muhammad, however, stood firm. Only nine companions remained around him, including Abu Bakr. Under Muhammad's instruction, Abbas shouted at the top of his voice, "O Muslims, come to the Prophet of Allah". The call was heard by the Muslim soldiers and they gathered beside Muhammad. When the Muslims had gathered in sufficient number, Muhammad ordered a charge against the enemy. In the hand-to-hand fight that followed the tribes were routed and they fled to Autas. Muhammad posted a contingent to guard the Hunayn pass and led the main army to Autas. In the confrontation at Autas the tribes could not withstand the Muslim onslaught. Believing continued resistance useless, the tribes broke camp and retired to Ta'if. Abu Bakr was commissioned by Muhammad to lead the attack against Ta'if. The tribes shut themselves in the fort and refused to come out in the open. The Muslims employed catapults, but without tangible result. The Muslims attempted to use a testudo formation, in which a group of soldiers shielded by a cover of cowhide advanced to set fire to the gate. However, the enemy threw red hot scraps of iron on the testudo, rendering it ineffective. The siege dragged on for two weeks, and still there was no sign of weakness in the fort. Muhammad held a council of war. Abu Bakr advised that the siege might be raised and that God would Himself make arrangements for the fall of the fort. The advice was accepted, and in February 630, the siege of Ta'if was raised and the Muslim army returned to Mecca. A few days later Malik bin Auf, the commander, came to Mecca and became a Muslim. Thus the prediction of Abu Bakr was fulfilled, and God Himself arranged for the surrender of Ta'if. In 631 AD, Muhammad sent from Medina a delegation of three hundred Muslims to perform the Hajj according to the new Islamic way. Abu Bakr was appointed as the leader of the delegation. The day after Abu Bakr and his party had left for the Hajj, Muhammad received a new revelation: Surah Tawbah, the ninth chapter of the Qur'an. It is related that when this revelation came, someone suggested to Muhammad that he should send news of it to Abu Bakr. Muhammad said that only a man of his house could proclaim the revelation. Muhammad summoned Ali, and asked him to proclaim a portion of Surah Tawbah to the people on the day of sacrifice when they assembled at Mina. Ali went forth on Muhammad's slit-eared camel, and overtook Abu Bakr. When Ali joined the party, Abu Bakr wanted to know whether he had come to give orders or to convey them. Ali said that he had not come to replace Abu Bakr as Amir-ul-Hajj, and that his only mission was to convey a special message to the people on behalf of Muhammad. Henceforward the non-Muslims were not to be allowed to visit the Kaaba or perform the pilgrimage. No one should circumambulate the Kaaba naked. Polytheism was not to be tolerated. Where the Muslims had any agreement with the polytheists such agreements would be honoured for the stipulated periods. Where there were no agreements a grace period of four months was provided and thereafter no quarter was to be given to the polytheists. From the day this proclamation was made a new era dawned, and Islam alone was to be supreme in Arabia. Abu Bakr also led one military campaign as commander, known as the Expedition of Abu Bakr As-Siddiq, which took place in Nejd, in July 628 (3rd Month 7AH in the Islamic calendar). Abu Bakr led a large platoon in Nejd on the order of Muhammad. Many were killed and taken prisoner. The Sunni Hadith collection Sunan Abu Dawud mentions the event. Abu Bakr attended the event of Ghadir Khumm, which took place a few months before Muhammad passed away. According to both Shia and Sunni sources, he was among the many who pledged allegiance to Ali at the event. In Medina, after the Farewell Pilgrimage and the event of Ghadir Khumm and shortly before his death, Muhammad granted command of an army to Usama bin Zayd. He commanded all the companions, except for his family, to go with Usama to Syria to avenge the Muslims’ defeat at the Battle of Mu'tah. Muhammad gave Usama the banner of Islam on the 18th day of the Islamic month of Safar in the year 11 A.H. Abu Bakr and Umar were among those that Muhammad commanded to join Usama's army. However, Abu Bakr and Umar protested because they thought that Usama, who was 18 or 20 at the time, was too young to lead an army, despite Muhammad's teachings that age and standing in society did not necessarily correspond to being a good general. In response to these worries, the Prophet said: "O Arabs! You are miserable because I have appointed Usama as your general, and you are raising questions if he is qualified to lead you in war. I know you are the same people who had raised the same question about his father. By God, Usama is qualified to be your general just as his father was qualified to be a general. Now obey his orders and go." Whenever Muhammad felt any relief from his fatal sickness, he would inquire as to whether Usama's army had left for Syria yet, and would continue urging his companions to leave for Syria. Muhammad even reportedly said, "Usama's army must leave at once. May Allah curse those men who do not go with him." However, while a few companions were ready to join Usama's army, many other companions, including Abu Bakr and Umar, disobeyed Muhammad's orders. It is also noted that this was the only military expedition where Muhammad urged his companions to go into battle no matter what; for other battles, if someone was unable to go, Muhammad would let them stay at home. Caliph Abu Bakr's empire at its peak in August 634. During Muhammad's lifetime, the Muslims in Medina were divided into two groups: the Ansar, who were originally from Medina, and the Muhajirun, who had converted to Islam in Mecca and migrated to Medina with Muhammad. During Muhammad's rule in Medina, they were satisfied, and they were glad when Muhammad announced that Ali would be his successor at the event of Ghadir Khumm, as they knew that Ali would continue Muhammad's fair policies towards them. However, when some of the Muhajirun refused to obey Muhammad's orders to follow Usama bin Zayd to Syria or to give him pen and paper to make a will, the Ansar knew that some of the Muhajirun were trying to take power upon Muhammad's death. They were worried that the rule of a Muhajirun (a foreigner, in their eyes), other than Muhammad or Ali, ruling over them would lead to their eventual oppression. Thus, when they saw some of the Muhajirun planning to take power upon Muhammad's death, they thought they would be just as good candidates for power as the Muhajirun. Thus, when Muhammad died, some of the Ansar went to a place known as Saqifa, where they nominated Sa'd ibn Ubadah to be the leader. Some spies among the Ansar informed Umar, who had been in Medina at the time, about what was happening in Saqifa. Umar looked for Abu Bakr, but he was not in Medina at the time; he was in Suk with his new wife. Umar, desperate to prevent the Ansar declaring Saad ibn Ubada caliph, offered to pledge allegiance to Abu Ubaidah ibn al-Jarrah (despite the previous pledges of allegiance of the Muslims, including Umar, to Ali). Abu Ubaidah refused, however, as he believed that Abu Bakr was more worthy than he was for leadership. Desperate to buy time, Umar proclaimed that Muhammad was not actually dead; he threatened to kill anyone who said otherwise. Abu Bakr then arrived in Medina and calmed Umar down, giving a convincing argument that Muhammad was dead. Abu Bakr, Umar, and Abu Ubaidah, leaving the still-unburied body of Muhammad, then went to Saqifa. The meeting in Saqifa, which is said to have been attended by fourteen people, took place while Ali was performing Muhammad's funeral rites. The Ansar and the three Muhajirun at Saqifa (Abu Bakr, Umar, and Abu Ubaidah) entered into a lengthy debate about who was more qualified to have leadership. The Ansar suggested having two leaders, one from the Muhajirun and one from the Ansar, while Abu Bakr proposed that the Muhajirun should be the leaders and the Ansar their ministers, which did not come to fruition. Debate continued until it reached a point when Bashir ibn Sa'ad, an Ansar who was jealous of Saad ibn Ubada, gave a speech supporting Abu Bakr, Umar, and Abu Ubaidah. Abu Bakr then told the Ansar to pledge allegiance to either Umar or Abu Ubaidah. Umar refused and instead pledged allegiance to Abu Bakr; Abu Ubaidah and Bashir followed Umar in doing so. Hubab ibn al-Mandhir then gave a short speech in which he called Bashir "a traitor to [his] own people." After that, a group of Bedouin tribesmen arrived. They were opponents of the Ansar, and when they saw the three pledges of allegiance to Abu Bakr, they pledged allegiance to Abu Bakr as well. The debates between the Ansar and the three Muhajirun at Saqifa was not peaceful, but rather was marked by violence and even bloodshed; Al-Tabari reported that it was "truly a scene from the period of Jahiliya (the pre-Islamic era)." Abu Bakr's reign lasted for 27 months, during which he crushed the rebellion of the Arab tribes throughout the Arabian Peninsula in the successful Ridda Wars. In the last months of his rule, he sent Khalid ibn al-Walid on conquests against the Sassanid Empire in Mesopotamia and against the Byzantine Empire in Syria. This would set in motion a historical trajectory (continued later on by Umar and Uthman ibn Affan) that in just a few short decades would lead to one of the largest empires in history. He had little time to pay attention to the administration of state, though state affairs remained stable during his Caliphate. On the advice of Umar and Abu Ubaidah ibn al-Jarrah, he agreed to draw a salary from the state treasury and discontinue his cloth trade. After Muhammad's death, apostasy arose in many areas outside Medina through the rise of several false prophets. Abu Bakr sent troops against the claimants and their forces and successfully defeated them. However, the wars against apostasy were expanded to include the use of force against tribes who opposed the rule of Abu Bakr. One such infamous incident was the massacre of the tribe of Banu Yerbo. During Muhammad's life, Malik ibn Nuweira was the revenue officer for Banu Yerbo; he collected tax money from Banu Yerbo and sent it to Medina. Upon Muhammad's death, however, he stopped collecting taxes and waited to hear how the new government had formed before sending any more money to Medina. Abu Bakr sent a force led by Khalid ibn al-Walid to Banu Yerbo. Khalid killed Malik, despite the fact that Malik still followed Islam and not the false prophets. Khalid then "married" Malik's widow, less than 24 hours after Malik's death, a practice unacceptable in Islam. Khalid also killed and captured many, if not all, the other members of Banu Yerbo. Umar demanded that Abu Bakr dismiss Khalid and put him on trial for murder and adultery, but Abu Bakr reportedly said that Khalid had made "an error of judgement" and let him go. Another version of the response to Khalid's actions claims that Khalid did not order Malik's execution but that his orders to the guards had been misunderstood, and that Abu Bakr accepted Khalid's excuse. The Ridda wars were over in approximately one year. After the conclusion of the Ridda wars, Abu Bakr did not want the troops to remain idle, so he launched expeditions into Persia and Syria. He reportedly assigned Amr ibn al-Aas to Palestine and Shurahbil ibn Hasana and Yazid ibn Abu Sufyan to Damascus. Abu Bakr, however, died before the expeditions into Persia and Syria were concluded. On 23 August 634, Abu Bakr fell sick and did not recover. He developed high fever and was confined to bed. His illness was prolonged, and when his condition worsened, he felt that his end was near. Realizing this, he sent for Ali and requested him to perform his ghusl since Ali had also done it for Muhammad. Abu Bakr felt that he should nominate his successor so that the issue should not be a cause of dissension among the Muslims after his death, though there was already controversy over Ali not having been appointed. He appointed Umar as his successor after discussing the matter with some companions. Some of them favored the nomination and others disliked it, due to the tough nature of Umar. In the name of Most Merciful God. This is the last will and testament of Abu Bakr bin Abu Quhafa, when he is in the last hour of the world, and the first of the next; an hour in which the infidel must believe, the wicked be convinced of their evil ways, I nominate Umar bin al Khattab as my successor. Therefore, hear to him and obey him. If he acts right, confirm his actions. My intentions are good, but I cannot see the future results. However, those who do ill shall render themselves liable to severe account hereafter. Fare you well. May you be ever attended by the Divine favor of blessing. Though the period of his caliphate covers only two years, two months and fifteen days, it included successful invasions of the two most powerful empires of the time: the Sassanid Empire and Byzantine Empire. Abu Bakr had the distinction of being the first Caliph in the history of Islam and also the first Caliph to nominate a successor. He was the only Caliph in the history of Islam who refunded to the state treasury at the time of his death the entire amount of the allowance that he had drawn during the period of his caliphate. He has the distinction of purchasing the land for Al-Masjid al-Nabawi. Sunni Muslims believe that Abu Bakr is the best man of all the human beings after the prophets. They also consider Abu Bakr as one of The Ten Promised Paradise (al-‘Ashara al-Mubashshara) whom Muhammad had testified were destined for Paradise. He is regarded as the "Successor of Allah's Messenger" (Khalifa Rasulullah), and first of the Rightly Guided Caliphs – i.e. Rashidun—and as the rightful successor to Muhammad. Abu Bakr had always been the closest friend and confidant of Muhammad throughout his life, being beside Muhammad at every major event. It was Abu Bakr's wisdom that Muhammad always honored. Abu Bakr is regarded among the best of Muhammad's followers; as Umar ibn Khattab stated, "If the faith of Abu Bakr was weighed against the faith of the people of the earth, the faith of Abu Bakr would outweigh the others." The Twelver Shia (as the main branch of Shia Islam, with 85% of all Shias) believe that Ali ibn Abi Talib was supposed to assume the Caliphate, and that he had been publicly and unambiguously appointed by Muhammad as his successor at Ghadir Khumm. It is also believed that Abu Bakr and Umar conspired to take over power in the Muslim nation after Muhammad's death, in a coup d'état against Ali. The Twelver Shi'a do not believe that Abu Bakr's being with Muhammad in the cave when the two fled Mecca was a meritorious act, and, indeed, find significant criticism of Abu Bakr in the Qur'anic verse of the cave. Most Twelver Shia criticize Abu Bakr because, after Muhammad's death, Abu Bakr refused to grant Muhammad's daughter, Fatimah, the lands of the village of Fadak which she claimed her father had given to her as a gift before his death. He refused to accept the testimony of her witnesses, so she claimed the land would still belong to her as inheritance from her deceased father. However, Abu Bakr replied by saying that Muhammad had told him that the prophets of God do not leave as inheritance any worldly possessions and on this basis he refused to give her the lands of Fadak. However, as Sayed Ali Asgher Razwy notes in his book A Restatement of the History of Islam & Muslims, Muhammad inherited a maid servant, five camels, and ten sheep. This proves that prophets can receive inheritance, and can pass on inheritance to others as well. In addition, Shias claim that Muhammad had given Fadak to Fatimah during his lifetime, and Fadak was therefore a gift to Fatimah, not inheritance. This view has also been supported some Sunnis, such as the Abbasid ruler Al-Ma'mun. The Twelver Shia accuse him of participating in the burning of the house of Ali and Fatima. The Twelver Shia believe that Abu Bakr sent Khalid ibn Walid to crush those who were in favour of Ali's caliphate (see Ridda Wars). The Twelver Shia strongly refute the idea that Abu Bakr or Umar were instrumental in the collection or preservation of the Qur'an, claiming that they should have accepted the copy of the book in the possession of Ali. After the death of Abu Bakr, Ali raised Muhammad ibn Abi Bakr. The Twelver Shia view Muhammad ibn Abi Bakr as one of the companions of Ali. When Muhammad ibn Abi Bakr was killed by the Ummayads, Aisha, the wife of Muhammad and also a renowned scholar of her time, raised and taught her nephew Qasim ibn Muhammad ibn Abu Bakr. Qasim ibn Muhammad ibn Abu Bakr's mother was from Ali's family and Qasim's daughter Farwah bint al-Qasim was married to Muhammad al-Baqir and was the mother of Jafar al-Sadiq. Therefore, Qasim ibn Muhammad ibn Abu Bakr was the grandson of Abu Bakr and the grandfather of Jafar al-Sadiq. Zaydis, the largest group amongst the Shia before the Safavid Dynasty and currently the second-largest group (although its population is only about 5% of all Shia Muslims), believe that on the last hour of Zayd ibn Ali (the uncle of Jafar al-Sadiq), he was betrayed by the people in Kufa who said to him: "May God have mercy on you! What do you have to say on the matter of Abu Bakr and Umar ibn al-Khattab?" Zayd ibn Ali said, "I have not heard anyone in my family renouncing them both nor saying anything but good about them...when they were entrusted with government they behaved justly with the people and acted according to the Qur'an and the Sunnah". ^ Saritoprak, Zeki. "Abu Bakr Al-Siddiq". Oxford Bibliographies. Oxford University Press. Retrieved 12 December 2018. ^ Razwy, Sayed Ali Asgher. A Restatement of the History of Islam & Muslims. p. 53. ^ Razwy, Sayed Ali Asgher. A Restatement of the History of Islam & Muslims. p. 154. ^ a b c Irving, Washington. The Life of Mohammed. ^ a b Musnad Ahmad Ibn Hanbal, Volume 4. p. 281. ^ a b al-Razi, Fakhr. Tafsir al-Kabir, Volume 12. pp. 49–50. ^ a b al-Tabrizi, al-Khatib. Mishkat al-Masabih. p. 557. ^ a b Khand, Mir. Habib al-Siyar, Volume 1, Part 3. p. 144. ^ a b c Abdullah. "Role of Umar before and In Saqifa". ^ Razwy, Sayed Ali Asgher. A Restatement of the History of Islam & Muslims. p. 364. Umar held Abu Bakr's hand, and placed his own hand on top of his as a sign of fealty. He had, by this act, acknowledged Abu Bakr as the khalifa. ^ Razwy, Sayed Ali Asgher. A Restatement of the History of Islam & Muslims. p. 365. Abu Obaida bin al-Jarrah and Bashir bin Saad Ansari also stepped forward, placed their hands on the hand of Abu Bakr, signifying their allegiance to him. ^ Grunebaum, G. E. Von. Classical Islam - A History 600-1258. ^ a b At-Tabari, Volume 3. pp. 208–210. ^ a b ibn Khaldun, Volume 2. p. 63. ^ Williams, John Alden (1971). Themes of Islamic Civilization. ^ Razwy, Sayed Ali Asgher. A Restatement of the History of Islam & Muslims. p. 429. ^ Ordoni, Abu Muhammad. Fatima The Gracious. Qum: Ansariyan Publications. ^ "The Advice of Asmaa bint Abu Bakr (ra) to her son Abdullah Ibn Zubair (ra)". ^ Drissner, Gerald (2016). Islam for Nerds - 500 Questions and Answers. Berlin: createspace. p. 432. ISBN 978-1530860180. ^ "Abu Bakr Al-Siddiq - Islamic Studies - Oxford Bibliographies - obo". Retrieved 13 September 2018. ^ "Sixth Session, Tuesday night, 28th Rajab 1345 A.H."
^ Shahid Ashraf (2004). Encyclopaedia of Holy Prophet and Companions. Anmol Publications PVT. LTD. ISBN 81-261-1940-3. ^ Muslim persecution of heretics during the marwanid period(64-132/684-750), Judd Steven, Al-Masq:Islam & the medieval Mediterranean.Apr.2011, Vol.23 Issue 1 pg1-14.14p. ^ Abu Bakr by Atta Mohy-ud-Din, published 1968 S. Chand Original from the University of Michigan, digitized 6 January 2006, ASIN B0006FFA0O. ^ Islamic Culture by the Islamic Cultural Board Published 1927 s.n. Original from the University of Michigan, digitized 27 March 2006. ^ Hazrat Abu Bakr, the First Caliph of Islam by Muhammad Habibur Rahman Khan Sherwani, published 1963 Sh. Muhammad Ashraf. Original from the University of Michigan. Digitized 14 November 2006. ^ Razwy, Sayed Ali Asgher. A Restatement of the History of Islam & Muslims. p. 153. The charge of Ali, Hamza and Abu Dujana spread panic and consternation in the ranks of the Makkans, and they began to waver. The Muslims pressed their advantage. ^ Haykal, Muhammad Husayn (1935). The Life of Muhammad. Cairo. ^ Razwy, Sayed Ali Asgher. A Restatement of the History of Islam & Muslims. p. 156. The Prophet, however, was in another part of the battlefield. He had been wounded, and his head and face were bleeding. A few Muslims, mainly the Ansar, were defending him. It was this little group, and its battle cries that caught Ali's attention. He tore his way through the enemy lines and came up to his comrades-in-arms. They stood surrounding the Prophet, and led by Abu Dujana, were doing the best they could to shield him from the missile weapons of the enemy. Ali was thrilled to see his master alive but he had no time to exchange greetings. The idolaters had renewed their attacks, and now it was Ali who had to beat them back. They charged repeatedly but he repulsed them each time. ^ Razwy, Sayed Ali Asgher. A Restatement of the History of Islam & Muslims. pp. 154–155. The surprise was not confined merely to the rank-and-file of the Muslim army; it was total. Some of the leading companions of the Prophet were also carried away with others before the charge of the enemy. Among the fugitives were both Abu Bakr and Umar. It is reported by Anas bin Nadhr, the uncle of Anas bin Malik, that Abu Bakr said in later times that when the Muslims fled from the battle of Uhud, and left the Messenger of God, he was the first one to return to him. Umar often said that when the Muslims were defeated in Uhud, he ran and climbed up a hill (Tabari, History, vol. IV, p. 96). Some of the companions managed to reach Medina and others sought refuge in the mountain caves and gullies. ^ Irving, Washington. The Life of Mohammed. As Mosaab resembled the Prophet in person, a shout was put up by the enemy that Mohammed was slain. The Koreishites were inspired with redoubled ardor at the sound; the Moslems fled in despair, bearing with them Abu Bakr and Omar, who were wounded. ^ Haykal, Muhammad Husayn (1935). The Life of Muhammad. Cairo. Those who thought that Muhammad had perished, including Abu Bakr and Umar, went toward the mountain and sat down. ^ Razwy, Sayed Ali Asgher. A Restatement of the History of Islam & Muslims. p. 192. ^ Ibn Ishaq. The Life of the Messenger of God. ^ Haykal, Muhammad Husayn (1935). The Life of Muhammad. Cairo. As the days went by, the Prophet sent Abu Bakr with a contingent and a flag to the fortress of Na'im; but he was not able to conquer it despite heavy fighting. The Prophet then sent Umar bin al-Khattab on the following day, but he fared no better than Abu Bakr. ^ Razwy, Sayed Ali Asgher. A Restatement of the History of Islam & Muslims. pp. 192–193. Some other captains also tried to capture the fortress but they also failed. ^ Razwy, Sayed Ali Asgher. A Restatement of the History of Islam & Muslims. p. 193. ^ Razwy, Sayed Ali Asgher. A Restatement of the History of Islam & Muslims. p. 255. ^ ibn Ishaq, Muhammad. The Life of the Messenger of God. ^ a b "Atlas Al-sīrah Al-Nabawīyah". Darussalam. 1 January 2004 – via Google Books. ^ Razwy, Sayed Ali Asgher. A Restatement of the History of Islam & Muslims. p. 283. ^ Muir, Sir William (1877). The Life of Mohammed. London. ^ "19 - The Life of Imam Ali: Prophet's (pbuh) Death - Dr. Sayed Ammar Nakshwani - Ramadhan 1435". YouTube. YouTube. ^ Bodley, R.V.C. (1946). The Messenger. New York. ^ Kelen, Betty. Muhammad, Messenger of God. ^ a b Razwy, Sayed Ali Asgher. A Restatement of the History of Islam & Muslims. p. 286. ^ Shahristani. Kitab al-Milal wan-Nihal. p. 8. ^ Razwy, Sayed Ali Asgher. A Restatement of the History of Islam & Muslims. p. 288. ^ Razwy, Sayed Ali Asgher. A Restatement of the History of Islam & Muslims. p. 356. ^ Razwy, Sayed Ali Asgher. A Restatement of the History of Islam & Muslims. p. 380. The Ansar were watching the events. It occurred to them that the refusal of the Muhajireen to accompany the army of Usama to Syria; their refusal to give pen, paper and ink to the Prophet when he was on his deathbed and wanted to write his will; and now the denial of his death, were all parts of a grand strategy to take the caliphate out of his house. They were also convinced that the Muhajireen who were defying the Prophet in his lifetime, would never let Ali succeed him on the throne. They, therefore, decided to choose their own leader. ^ Razwy, Sayed Ali Asgher. A Restatement of the History of Islam & Muslims. p. 379. ^ at-Tabari, Volume 3. p. 208. ^ Suhufi (2003). Stories from the Qur'an. Islamic Seminary Publications. p. 312. ^ Razwy, Sayed Ali Asgher. A Restatement of the History of Islam & Muslims. p. 365. ^ Razwy, Sayed Ali Asgher. A Restatement of the History of Islam & Muslims. pp. 422–425. ^ "How Long Must a Woman Wait Before She Remarries?". Seekershub. ^ Glubb, Sir John (1963). The Great Arab Conquests. p. 112. Khalid returning to Medina, claimed that he had not ordered the execution of Malik, but that his instructions to the guards had been misunderstood. The wise Abu Bakr, whatever he may have thought of the morals of his lieutenant, was aware of his prowess. ‘I will not sheathe a sword which God has drawn for His service,' he exclaimed. Khalid's excuses were accepted. ^ Razwy, Sayed Ali Asgher. A Restatement of the History of Islam & Muslims. p. 429. Abu Bakr spent full one year in fighting against the Ahl-er-Ridda and the false Prophets. ^ Razwy, Sayed Ali Asgher. A Restatement of the History of Islam & Muslims. p. 429. However, at the successful termination of these campaigns, he did not want his troops to be idle; he sent them to invade the neighboring countries of Syria and Persia. ^ Williams, John Alden (1971). Themes of Islamic Civilization. It is reported on the authority of alWaqidi that Abu Bakr assigned Amr (ibn al-Aas) to Palestine; Shurahbil (ibn Hasana) and Yazid (ibn Abu Sofyan) to Damascus. ^ Razwy, Sayed Ali Asgher. A Restatement of the History of Islam & Muslims. p. 429. The campaigns against Syria and Persia were begun by Abu Bakr but he died before he could conclude them. They were brought to a successful conclusion by his successor, Umar bin al-Khattab. ^ "Khalifa Abu Bakr - Death of Abu Bakr - Alim.org". ^ Narrated by al-Bayhaqi in ‘al-Jamia’ lashu’ab al-Eemaan’ (1:18) and its narrators are trustworthy. ^ "Shia Islam's Holiest Sites". ^ "Usurping the Land of Fadak". Al-Islam.org. ^ "Chapter 44: The Story of Fadak". Al-Islam.org. ^ twelvershia.net (8 May 2014). "Fadak and Inheritance Q&A". TwelverShia.net. ^ al-islam.org, Fatima the Gracious, by Abu - Muhammad Ordoni, 1987. Section entitled Abu Bakr Versus Fatima az-Zahra (sa). See also Sahih Al Bukhari Volume 5, Book 57, Number 60, which says: "Fatima sent somebody to Abu Bakr asking him to give her her inheritance from the Prophet from what Allah had given to His Apostle through Fai (i.e. booty gained without fighting). She asked for the Sadaqa (i.e. wealth assigned for charitable purposes) of the Prophet at Medina, and Fadak, and what remained of the Khumus (i.e., one-fifth) of the Khaibar booty. Abu Bakr said, "Allah's Apostle said, 'We (Prophets), our property is not inherited, and whatever we leave is Sadaqa, but Muhammad's Family can eat from this property, i.e. Allah's property, but they have no right to take more than the food they need.' By Allah! I will not bring any change in dealing with the Sadaqa of the Prophet (and will keep them) as they used to be observed in his (i.e. the Prophet's) life-time, and I will dispose with it as Allah's Apostle used to do," Then 'Ali said, "I testify that None has the right to be worshipped but Allah, and that Muhammad is His Apostle," and added, "O Abu Bakr! We acknowledge your superiority." Then he (i.e. 'Ali) mentioned their own relationship to Allah's Apostle and their right. Abu Bakr then spoke saying, "By Allah in Whose Hands my life is. I love to do good to the relatives of Allah's Apostle rather than to my own relatives" Abu Bakr added: Look at Muhammad through his family." See also Sahih Al Bukhari Volume 8, Book 80, Number 722, which says: "Aisha said, 'When Allah's Apostle died, his wives intended to send 'Uthman to Abu Bakr asking him for their share of the inheritance.' Then "Aisha said to them, 'Didn't Allah's Apostle say, Our (Apostles') property is not to be inherited, and whatever we leave is to be spent in charity?'" ^ Razwy, Ali Asgher. A Restatement of the History of Islam & Muslims. pp. 34–35. ^ Jalālī, Ḥusaynī. Fadak wa l-ʿawālī. p. 141. ^ Shahīdī. Zindigānī-yi Fātima-yi Zahrā. p. 117. ^ Ibn Qutayba al Dinawari. Al Imama Wa'l Siyasa. ^ Akbar Shah Najeebabadi, The history of Islam. B0006RTNB4. ^ The Encyclopedia of Religion Vol.16, Mircea Eliade, Charles J. Adams, Macmillan, 1987, p243. "They were called "Rafida by the followers of Zayd"
Walker, Adam, Abu Bakr al-Siddiq, in Muhammad in History, Thought, and Culture: An Encyclopedia of the Prophet of God (2 vols. ), Edited by C. Fitzpatrick and A. Walker, Santa Barbara, ABC-CLIO, 2014. Wikisource has the text of the 1911 Encyclopædia Britannica article Abu-Bekr. Sirah of Abu Bakr (Radia'Allahuanhu) Part 1 by Shaykh Sayyed Muhammad bin Yahya Al-Husayni Al-Ninowy.